Of course it was beyond my abilities as a young teenager, both financial and skills. But now, 63 years later those problems are far behind me. were stand off scale of the first IC powered Woolwich. 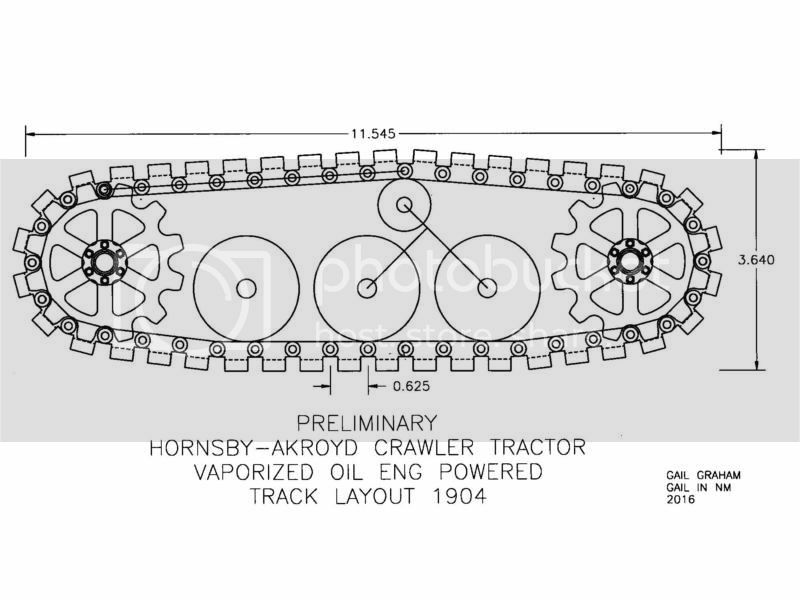 So it seemed reasonable to build a stand off scale of the first IC powered Crawler tractor, the Hornssby-Akroyd Crawler Tractor built in several forms in the early 1900's. It used the same basic engine as the Woolwich locomotive so most of the engine design work is all ready done. Dam! More , have to follow Chris's lead & buy by the truck load! good idea. I will following along with interest, as already done with Chris and his Lombard Hauler. Greetings Gail. I'll be following along too. Looks like a challenging and fun project. Should be a bit more reliable than the steam powered ones before it, there are a couple of large scale models of those ebout which may be of use for detail of the running gear. Glad to have you along for the ride Kerrin , Achhim, Rudy and Jason. Don't worry about the pop corn supply Kerrin. This will be a slow thread. Mother Nature has not been kind to me the last 10 years so I work slow. I am losing my vision and have to use visual aids to read the dials and DROs any more. I also had a stroke a few years ago and had to learn how to print my name again. And nerve damage has reduced my sense of feel. My touch typing is coming back but I still make lots of errors and don't see the computer monitor well enough to catch them all. So don't be too critical. I am still making chips but I have to have some assistance with assembly. I have already lined up a friend who I have worked with before to help. I will be machining two sets of parts, one for him and one for me. To clarify, when I speak of stand off scale, I mean stand WAY off and compare to a fuzzy photo and say "well it could be". If you wear glasses it helps to take them off also. But the finished model will have the flavor of the original. Not much documentation exists of the proto type. The above photo is most of it. Only a few were builtm but Horssby built a lot of steam powered tractors and later multi cylinder tractors. I am taking some details from them to assist the design. The design is not complete, but is far enough along to start building with confidence. So to start with here is a preliminary side view of the track layout. I always liked these crawlers and many years ago built an even more' stand off scale' one with Mechano powered by a Bowman steam engine. The bars along the sides operated the steering brakes. Oh good! I get to watch someone else making all the track parts!! I saw that picture while researching the Lombard, it should be a fun one to run. Looking forward to popcorn munching along! Interesting project Gail; it will be fun to follow along with your progress. Thanks for the PDF Paul. Building something like this is kind of like assembling a jigsaw puzzle with out the picture of it. Every little part or bit of information that gets added gives you a better idea of what the finished article will look like. Roger: Neat model. Nothing like having toys to play with. Especially ones that you have built. Chris: Glad to have you along. The Hornsby tracks are very different from the Lombard tracks, but both have a lot of parts. I have a CNC mill and lathe so the multiple parts will be easier for me. Not that any of the parts could not be made on manual machines, but with my failing vision I ccan not. Also, since this is a "look alike" and not a scale model I won't have as many details. I will also be using more aluminum and brass instead of stainless steel. Dave: Glad to have you with us. I will probably need all the moral support I can get before this is over. So, with most of teh preliminary comments out of the way it's time to make some parts. Like Chris, I stated on the tracks.I have built similar parts to most of the other parts on the project but have never built any tracks. I wanted to make sure that they were functional first. The track plates are 6061 aluminum. The overall size of each plate is 1.265 x .875 x .484. I initially drew them as 1.250 wide but wanted to use 1/8 x 1-1/4 dowel pins for the hinges. After measuring the dowel pins I found that most of them were about 0.005 longer than the nominal 1-1/4 so I widened that track witth by a 1/64 so the pins would not protrude. I got a good buy on some 1/2 x 10 extrusion pieces 12 inches long. 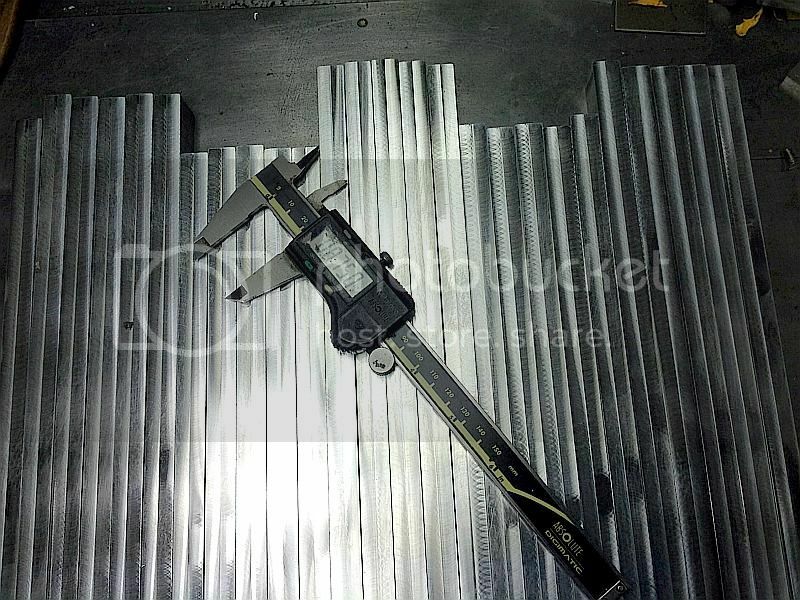 So the first operation was to saw it into 10 inch long strips that were wide enough to finish to the 0.875 dimension. 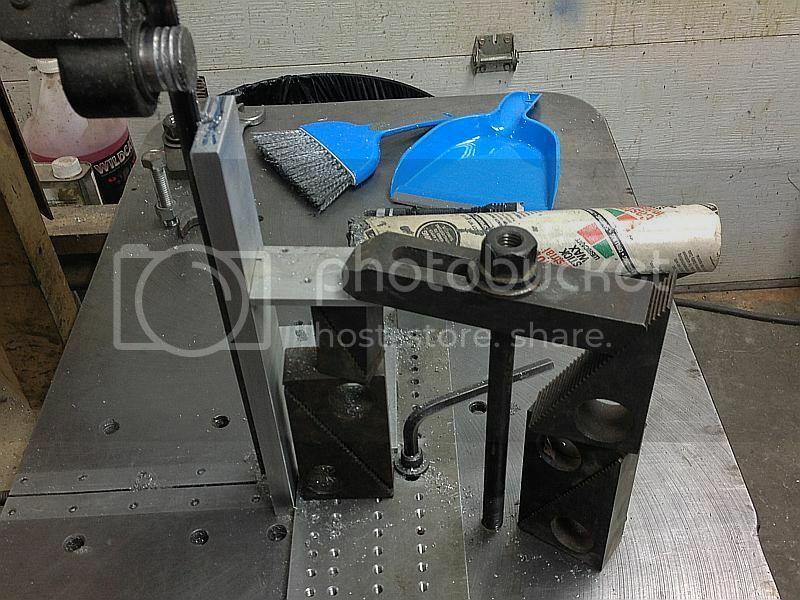 I have a roll in band saw, moving head, that will take 14 inch tall parts so I set up to cut the strips through the plate with with the10 inch length being parallel to the length of the saw blade. This gave me a straight edge with little machining to clean it up. Thats quite a setup in the band saw! How will the dowel pins be held in position in the track plates? The dowel pins will be held in place with a dab of Loctite 680 on each of the outer hinge tabs on each plate with the hinging action taking place on the inner tabs. More on that later. The saw set up is not pretty but it is safe and functional. The roll in band saw has an adjustable counter weight to set the cutting pressure and a hydraulic cylinder to set the max rate of feed. Once set up it is automatic. Took about 2 minutes to cut each strip. In the preliminary drawing above there are 40 plates in each tread. I think that this will be enough but I cut 45 for each side in case I need to stretch things out a bit to fit everything inside the chassis. Two battery packs, one for ignition and one for the radio, radio, servos, gear boxes, CDI ignition and things like that. I got 7 plates out of each strip. I cut 26 strips. This gives me 180 plates, 45 for each track, 2 tracks per tractor and 2 tractors. Plus a couple of extra to screw up. After the strip were cut they were milled to the 0.875 finished dimension. No photo of the operation, but I have multiple 4 inch vices on the mill spaced 4 inches apart. The strip was set on parallels in each of 2 vices so each end was rigidly supported and the first edge of all strips cleaned up. Then flipped over and all the strips were milled to width. Seeing all that stock gives a better impression of how many parts. I also started with 5 or 6 extras, used them all for goofs, but that was a manual setup vs the cnc.